I get a lot of offers to review books. I wish I could accept every offer and take the time to read them all, but with my job and other responsibilities, I just can’t. But not too long ago, I accepted the chance to review Prepper Pete Prepares by Kermit Jones, Jr. This book peeked my interest because it is a children’s book. Being an educator, I couldn’t resist. I thumbed through the book rather quickly when I received it. It looked like many other children’s books that I have read to classes. As the semester came to a close, I offered to read to one of the classes that doesn’t usually have a parent reader on Fridays. I told the teacher that I was going to read a book on preparedness. As I read the book, I started to worry a little about reading this to the class. The book started off talking about general preparedness, but then went into things like firearms, pandemics, solar flares, bunkers…all the prepper stuff. I let the teacher read the book before I made my final decision. She is very practical and although I don’t know if she is a prepper, I’m sure she knows that it makes good sense. But after reading it, she agreed that it wouldn’t be a good idea. Now, let me explain why I didn’t read it to the class. 2nd graders are really attentive and bright. Parents would have asked their children later that evening, “How was your day?” and “Did you do anything interesting?” Students would have said, “Yes, Mr. Sepulveda read to the class about an ant called Prepper Pete who was preparing for bad stuff that was going to happen. We are all going to die and I’m scared!” I would have received calls! My principal would have received calls! The fact is, I recommend this book to anyone who has young children. The difference is that you can drive the conversation and spend time with your own child explaining everything that the book talks about. That is something that I wouldn’t have been able to do if I read the book to the class. 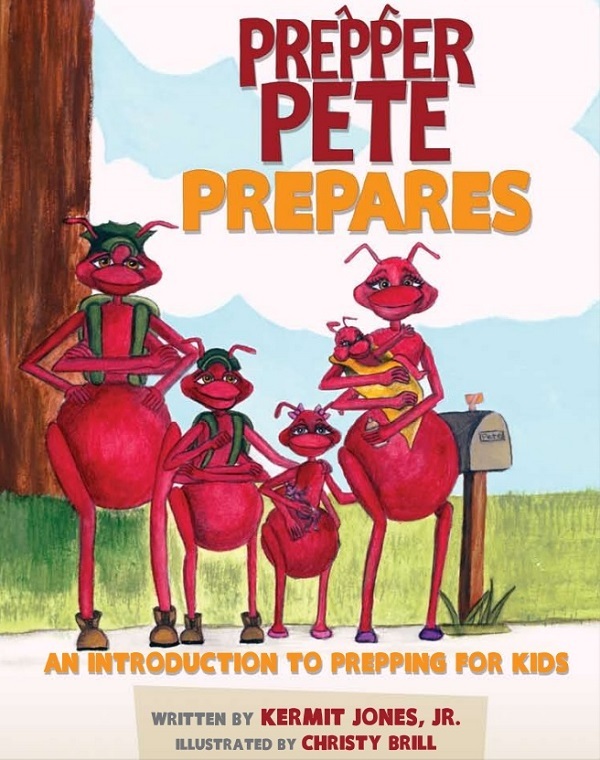 Prepper Pete Prepares is an introduction to preparedness for young children. As a parent, after reading it through with your child, you can take specific pages and topics and discuss those with your child. How well prepared do you think our family is compared to other families? Which natural disasters effect our community? Do you know where the flashlights are if the lights go out? How many tools can you name in the garage that don’t use electricity? How does staying healthy help us to be prepared? How often do you wash your hands to prevent spreading germs? What kinds of things should you be thinking about when you go into public? What can you do out in public to keep yourself and our family safe? Why is it a good idea to not talk about what kinds of ways we prepare with others? What kind of skills would you like to learn to be better prepared? Fish, Camp, Hunt, Build Fires, Use a Knife? Where are our bugout bags located and do you know how to use all the items in there? Does knowing that our family prepares make you feel better and safe in case of an emergency? Jones ends the book with a note to grownups about teaching kids how to think! I appreciate that about this author. Asking probing questions and getting kids to talk about preparedness is a really good start! Prepper Pete Prepares can be purchased on Amazon for Kindle or Paperback. – Click here for more reviews and to purchase the book.